GWCT News & Advisory: Has the RSPB found a silver bullet? If you are happy to cherry pick your facts, birds of prey, and their long history of persecution by the hand of man, make them the press officer’s dream. When it comes to the hen harrier, is the failure to explain the situation just perpetuating the problem? What’s wrong with a bit of emotional cherry picking? “Long ago, we in the RSPB used to hold, in all honesty, to the view that a few hen harriers scattered around the uplands weren’t going to present a great threat to driven grouse shooting and that the grouse moor managers’ fears were greatly exaggerated. We were wrong. So now we know: 4,000 jobs, reliant on the protection of wild grouse , can be directly threatened by high numbers of hen harriers which eat them. But harriers are protected and in England at least are at a low ebb. So how do we grow a raptor population whilst increasing their prey? Could the hen harrier population be distracted from taking grouse chicks by diversionary feeding ? Well, the RSPB spent 6 years testing “whether [the] diversionary feeding of kestrels is effective at increasing little tern breeding success”. The results have yet to be published in the peer-reviewed scientific literature. Yet recent press releases here and here would suggest that diversionary feeding is the perfect silver bullet. Simon Barnes in his Wild Notebook  appears to like the idea that “Diversionary feeding is simple, effective and cheap, it reduces grouse predation by 86%”. 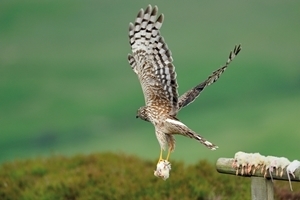 Yes, predation by hen harriers was reduced but the grouse population did not recover. Is there any evidence that diversionary feeding alone can overcome the root cause of the harrier-grouse conflict? No. Shame - it would be so much easier to have a silver bullet to improve the lot of the hen harrier. Perhaps it is time to stop perpetuating the problem and start supporting the more comprehensive Defra led Joint Recovery Plan? Fighting for Birds - Mark Avery, 2012. Mark was the RSPB Conservation Director from 1998-2011. Where gamekeepers manage moors for grouse there is a significant increase in birds that are otherwise declining such as lapwing, curlew and golden plover. The GWCT are concerned about the impact of any job losses on these scarce birds. Redpath, S M, Thirgood, S J, and Leckie, F M 2001 Does supplementary feeding reduce predation of red grouse by hen harriers? Journal of Applied Ecology38: 1157–1168.